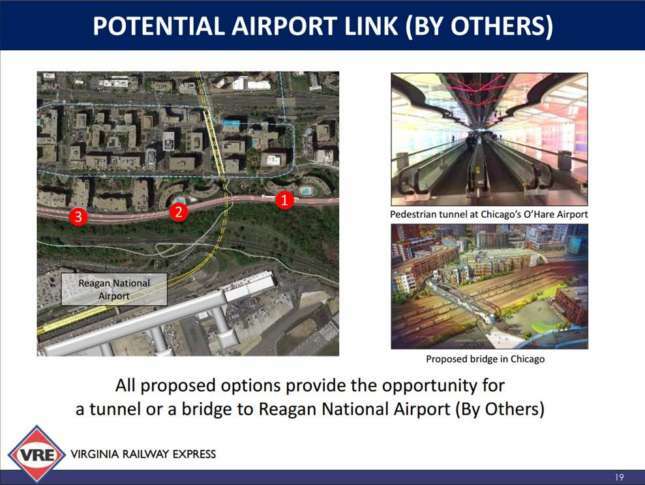 Virginia Railway Express officials will present initial options for a larger station that could include a direct connection to Reagan National Airport and could make transfers to Metro easier. WASHINGTON — Virginia Railway Express plans to expand and shift its Crystal City station could include a direct connection to Reagan National Airport. At a public meeting Thursday evening, VRE will present initial options for a larger station that could also make it easier for riders to transfer to Metro. According to VRE surveys last year, about 18 percent of riders who get off at Crystal City transfer to Metro, mainly to reach Rosslyn or the Pentagon. About 69 percent of riders who get off at VRE’s third-busiest destination station walk to work in the Crystal City or Pentagon City areas. The new station would be between two tracks, so that trains could stop on either of two tracks rather than just one that is served by the platform today. It would also be longer to allow VRE to lengthen trains to up to 10 cars to serve more riders. The new station is projected to fit within the existing railroad right of way, so no property would be taken. The project is a small but important piece of broader plans to expand rail service through Alexandria and Arlington into D.C. to add more trains for commuters, longer-distance Amtrak riders and freight. The District and CSX Transportation, which owns the tracks, are working on plans to add a new Long Bridge connecting Arlington to D.C. next to the 14th Street Bridge that would expand the choke point from two tracks to as many as four. Allen said the most likely options are a new two-track bridge either just to the north or south of the existing Long Bridge. Virginia has a federal grant to add a fourth track from Alexandria up to the bridge. Over the next year, Allen hopes VRE can select a site for the new station in the middle of those four tracks and start design work. The station could be constructed within five years as part of the broader rail expansion. Costs would become clearer this summer when general concept designs are completed. “All this is leading toward adding more capacity for the CSX trains, for the intercity trains [Amtrak], and for VRE so that all of us can move trains when we need them, and, from our standpoint, to provide more capacity for the commuters from Virginia that go into the core of the region — both Crystal City and then into downtown D.C.,” Allen said. Eventually, that could include Maryland’s MARC trains continuing past Union Station to L’Enfant Plaza, Crystal City and Alexandria. “The idea of potentially having MARC trains come down into the core and into Northern Virginia would really expand the ability to move people throughout the region and really help solve some of the regional transportation challenges we all have,” he added. VRE planners believe that with major growth in office space, apartments and shopping planned for the Crystal City area, if trains run both ways, the commuter railroads could provide an alternative to Metro for riders looking for a more direct connection to the Capitol Hill and Union Station areas. Crystal City is served by both the Fredericksburg and Manassas lines. In addition to the VRE station changes, there are long-term plans for a second Metro entrance at Crystal City that would be closer to the VRE station, and Reagan National Airport just finished final designs for major changes to replace Gate 35X and shift security checkpoints. Any connection from the station to Reagan would cross over or under the George Washington Parkway, which means it would require National Park Service approval. Thursday night’s public meeting will be held from 5 to 7:30 p.m. at 2011 Crystal Drive in Arlington on the 11th floor. A formal presentation of the plans is scheduled for 5:30.